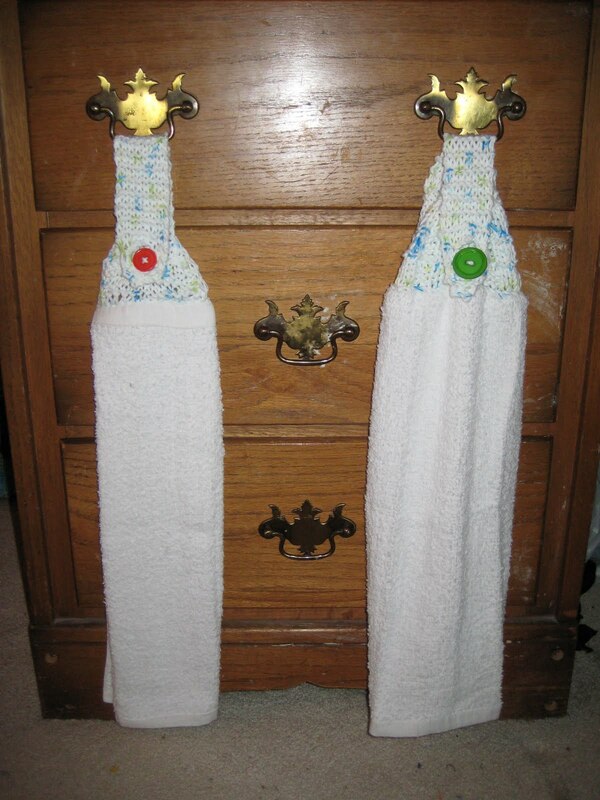 I recently finished two different towel toppers. 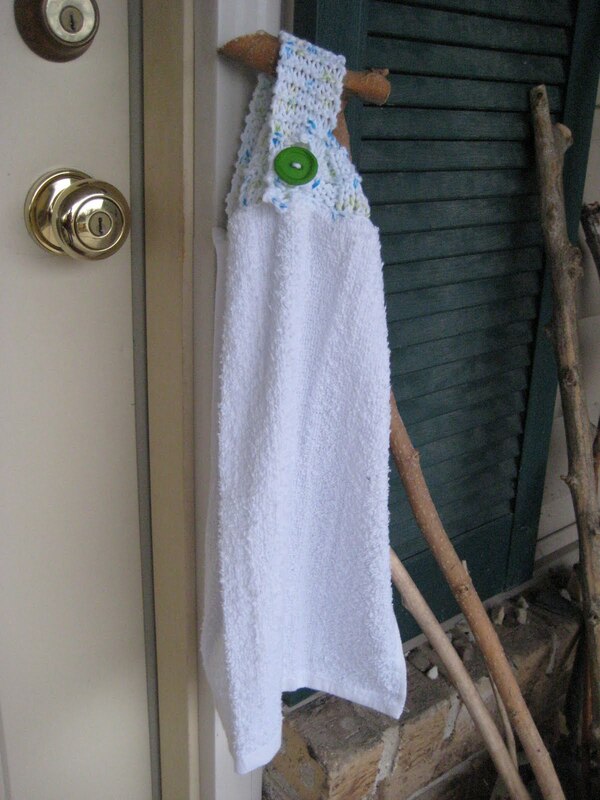 Towel toppers are usually crocheted to a towel to keep them from slipping off the handle of the oven door. 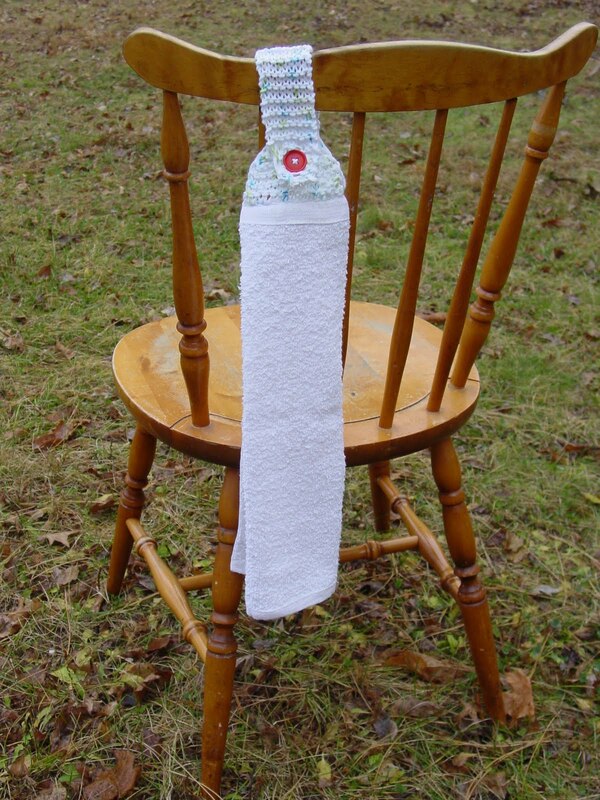 Because I like having only TWO stitches to memorize, I searched for knitted towel toppers. Not as many patterns as for crochet, but I found two. I looked for two patterns because I had just purchased two bar towels and wanted them to be different from each other. 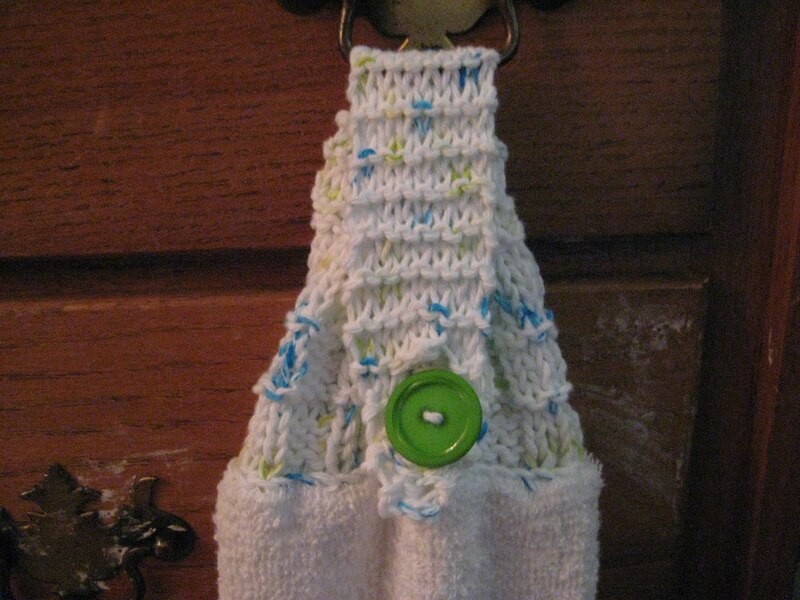 I used Lily Sugar ‘n Cream yarn (coupons for Michael’s are the best). The color I chose is not listed, and I threw the ball band away. The yarn is white with colored flecks running through. The first pattern I made was this one (pictured on the chair with the coral button) at Finding Salihah. The blog does not appear to be active anymore, but I thought the pattern looked clear enough to not need future support. There was an option to use velcro. I opted for a buttonhole. There was a buttonhole correction in the comment area, and after reading it, I decided to use it. And using a pattern from an inactive blogger was all right because it was quick to work up because it was all knit stitching and needed no clarification. I had no problems making this. I would probably add the phrase “Stitch loosely” to the backstitching instruction, but that is the only change. The second pattern I used came from Lion Brand (pictured on a branch with the green button). 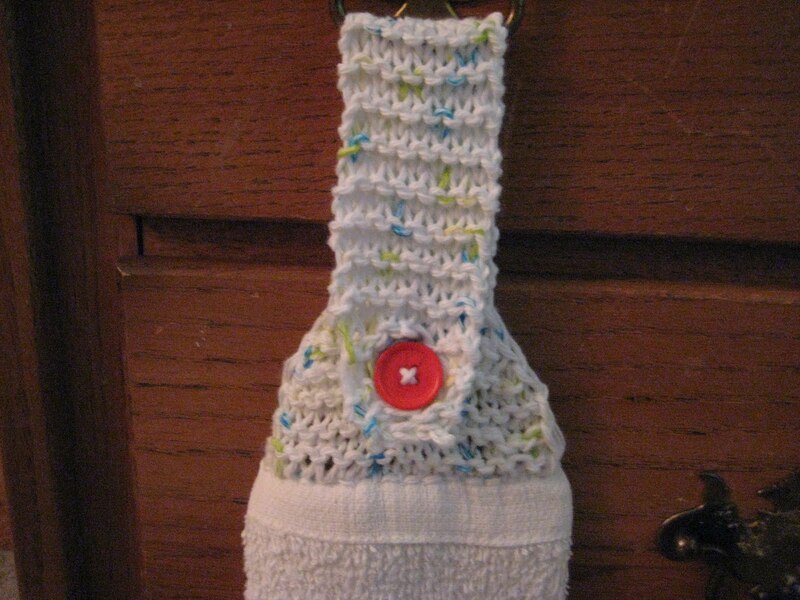 There are actually two patterns located at this link, one for a woven towel and one for a terrycloth towel. I used the second, or terrycloth, pattern. I did not follow the pattern to a T and it turned out pretty well. My variations follow. For starters, I did not use embroidery floss. I used the cotton yarn and made 30-something chain stitches. Not a big deal. Easy to adapt the pattern to fit. It definitely took longer than the backstitch required of Salihah’s pattern, but she had me go through three layers of towel. Lion had me go through just one layer. The biggest issue I had with this pattern was the buttonhole. It’s HUGE. I had to buy a button to fit, and at 1 1/16″ it is still a little small for the hole. Large buttons are hard to find at my local fabric stores. Or my gauge is too loose for this pattern. I was also a little annoyed at the top hem being folded over like a flap behind my knitwork. Aesthetics, you know. It’s in the back, but it is stiff along that hem. I also can’t tell if the handle is long enough. It is shorter than the other topper. On the other hand, the topper looks like a basketweave, which _is_ nice to look at.